Hubs wanted meatballs as part of our "SuperBowl Smorgasbord." I have my own way of making meatballs, but since I was using these on their own rather than with spaghetti, I kind of wanted to try something completely different, and in terms of how I make my Italian meatballs, these are different. Italian seasoning, oregano, garlic salt, hot pepper sauce and Worcerstershire sauce are all different additions for me and, other than omitting the red pepper and hot sauce in consideration of Hubs' sensitive innards, I resisted the strong urge to make these more compliant with what I was familiar with. I popped half of one in my mouth and "Mmmm!" ran through my mind. They have a nice balance of flavors that will only get better once the flavors develop even further in my homemade tomato sauce, I thought. 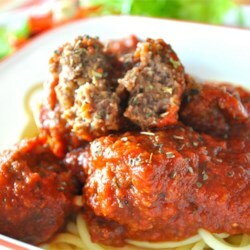 I had Hubs taste the other half and the first word out of his meatball stuffed mouth was, "Yum!" (Trust me, he NEVER says "yum") I've got more cooking to do to complete our smorgasbord (Go Pack!!!) but these meatballs are going to be one, fine contribution. Way to go (again!) LovestoHost!